“With the vacating of the old Bank of Bermuda building by HSBC at Albuoy’s Point, the perfect opportunity has arisen for the City of Hamilton to carry out a revamp of the park,” the City said today. “The Bill Ming sculpture, Against da Tide, which occupies the sidewalk at the entrance to the building on Front Street, is currently owned by HSBC and was installed as the required public art component for HSBC’s Harbourview Building. “HSBC has offered to donate the sculpture to the City if it can be suitably relocated. To that end the City has been working with local firm, Cooper Gardner, to develop a relocation plan to include a redevelopment of Albuoy’s Point. 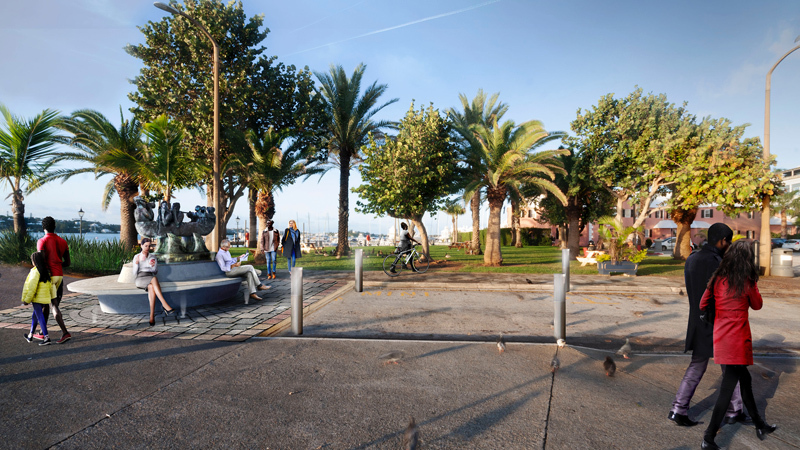 “The upgrades will include improved seating and shade, up-lighting of the existing trees and revitalization of the pedestrian areas for accessing the park as well as the waterfront. Also included in the plan is the relocation of the Jarvis Bay Memorial to a better place of prominence within the park. Maybe they could set up an area round the back of Bulls Head were the bums could hang out all day, pee everywhere, and swear drunkenly at each other. CoH is the best at wasting money. Well second best. Can’t take PLP from top of the charts. Get rid of da bums they are gross. The minute it’s finished the bums will be peeing there. They make areas pretty and then the bums take over and it smells like urine. Apparently your comment is inhumane….urine trouble with Mr. Bie What. Corporation can afford this by saving a ton of money on fertilizer due to the copious amounts of human excrement left in their garden areas. What can you really do though? They do it around the town or they do it in the back of a police car. Then what? Jail them at $80,000 a year because they’re nasty? Maybe cut the budget and see if we have repeat offenders who like prison that costs $20k per year. There is no point spending scarce resources to make somewhere pretty, if the first thing that happens is bums go there, pee everywhere, make it stink, and then hang around there all day drunkenly swearing loudly. It’s not exactly a tourist attraction. Please consider parking. Seniors are struggling with all of these changes. How much parking is on Albouys…. right none. Great…make it nicer for the bums. Picnic tables by Flag Pole = congregation area for bums and it smells like pee…. seating areas on Reid Street = seating for bums…and now another nice area for the bums. First the huge sidewalk’s that now cause congestion and now no parking. COH circus of humans are in that office. Yup another fiasco by the COH it looks as if they had their way they would not have any parking in the city period. IT’S A CITY NOT A PARK FOR CRYING OUT LOUD! Question.. Your comment is spot on. Bermuda is the only place in the world that uses its prime real estate as car parks. Waterfront property should all be parks. If you need parking in Hamilton dig out City Hall Car Park, go down three floors. Having cars parked on the waters edge is ludicrous. Funny how Bermudians travel to cities & have no problem walking for miles up & down sidewalks doing their shopping. They might rent a car & have to park out in booneyland at the malls or Walmart. No problem at all with that. Here they want to park right outside the door of the business. Nothing but lazyness. Yes, there is a serious parking problem in Hamilton. There are not enough loading zones for deliveries. Loading zones that are there are abused by people using them for personal business or, even worse, as all day parking for the shop van. There is nowhere near enough cycle parking. 6 people with 6 bikes take up the room of one person with a car. If anything streetside car parking should be reduced, bike parking increased, loading zone use policed for active work taking place out of the vehicle, more handicapped parking &, with an ageing population, space designated for senior parking only. Here we go again. Beautify = take away parking and make ridiculously wide side walks. Lets make it comfy for our street people to occupy this area with benches and shade so that they can urinate where ever they want, leave trash for others to clean up. Roll on Reid Street outside Washington Mall. Wow sounds like our extra wide junction sidewalks. I can’t wait for the first parade in Hamilton where I can sprawl out in total comfort with my posse and leave my broken chairs, tents and the like behind for you all to clean up. It would in most jurisdictions be a good idea, however, this is what we face in Bermy. Just look at Front Street, you furnished it with shade, benches, trash receptacles which always fail to catch any rubbish. This has now sadly become the home of street persons which occupy it daily. What do our visitors say when they get off the cruise ships and hear all the cursing, arguments, fights and the putrid smell of urine? Not good. Great, even less parking. People look to avoid Hamilton due to the limited parking as is. Maybe COH intentionally getting rid of street parking since they can’t regulate. Just push the public to use the parking with barrier system. The COH is doing their utmost best to remove as much street parking as possible to force the public into COH lots.